Your drains work hard all year round, however most people forget about them completely until something goes wrong. We recommend to our customers that they have a survey done at least every three years on the condition of the drains to stop problems before they become costly to repair. Our workforce have over 30 years experience in all aspects of groundworks. We are able to carry out excavations up to 4m deep to repair existing or install new drainage, soak away systems and tanks. We are fully insured and qualified. In many instances drainage is covered on an accidental damage policy for your building insurance, If you believe you have a problem with your drainage please call us on 01843 293 040 to discuss the problems you are experiencing and we will be happy to offer advice and assistance. 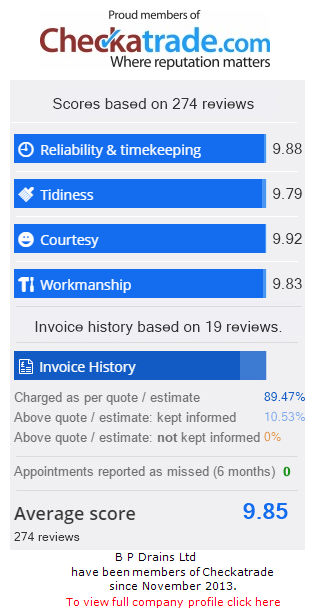 Demand for our professional but fairly-priced services has seen us build an excellent reputation in Kent and we gain much of our work from repeat business and recommendations. We provide a genuine 24 hour call out service with rapid response times, fixed rates and no call out charge for drain unblocking. To see details and case studies on causes and solutions, please select one of the options. Tree roots tend to grow towards sewer pipes due to the vapor created on the walls of the pipe as warm water passes through it. Once the tree roots find access into the pipe work through a crack or loose joint they will continue to grow. Leaking drain pipes is one of the common causes of subsidence in a property. The water escaping from the system will cause the soil beneath the building to soften and gradually wash away. Pitch fibre pipe work was commonly installed between the 1950’s and 1970’s due to it being a cheaper alternative to clay pipes. As with any product, it has a limited lifetime and pitch fibre is unfortunately nearing its end. Got a problem with your drains? Copyright © 2019 BP Drains. All Rights Reserved.